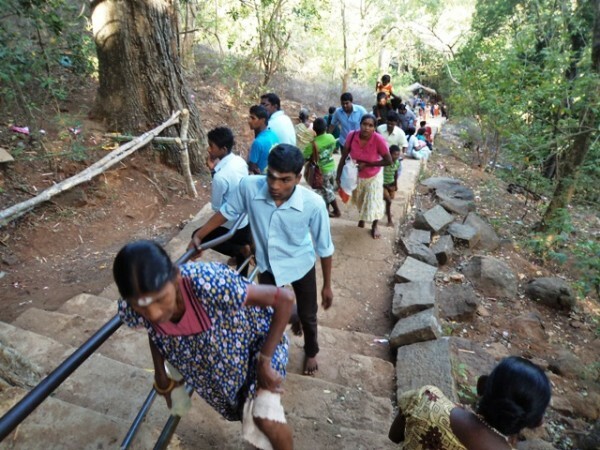 The number of Tamil and Sinhalese pilgrims who visit the historic Kathirgamam Kathiraimalai Murugan temple is day by day increasing. 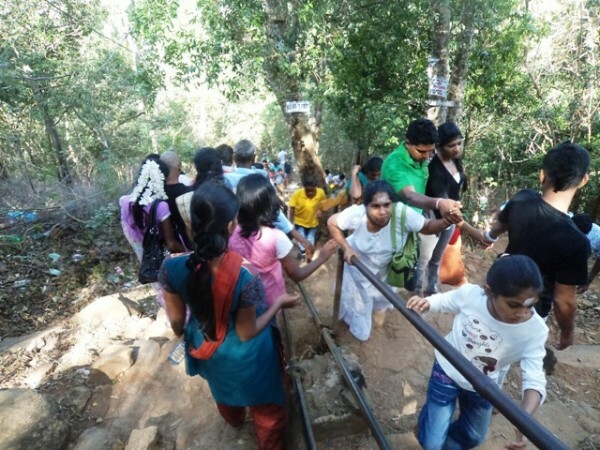 The path used to reach Eezhumalai which is at a distance of three kilometres from Kathirgamam was poorly deteriorated in the past. Recently, most of the areas in the path were repaired and stairs were improved to a larger extent. Hence the pilgrims who visit Kathirgamam now always go tho Kathiraimalai also before returning back. Those days, they used to say that there was a Murugan temple which had the Vel only. Today there is a complex of shrines for both Hindu and Buddhists. 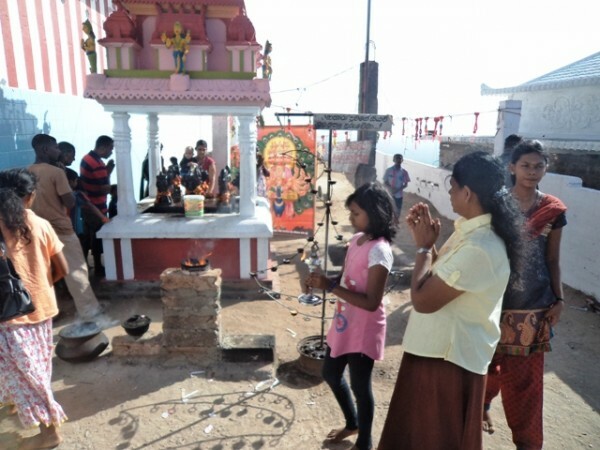 For those people who pray to God for some offerings and go to temple, they put several food items (aval, groundnuts and pongal) in Vel and after prayers they distribute them to the pilgrims who are standing there. There is also a big Buddhist temple near by this one and a Shiva temple. Lot of Arasa trees are there. There is a good breeze coming from somewhere at that place. There is also a problem of beggars on the way to Kathiraimalai. Moreover there are troubles by monkeys also. For those who can’t climb by foot, jeep has been arranged at a cost of Rs. 350 per head. I look around Vedihitikanda in the distance, and see a glistering wall around the temple complex on the summit. I wish I was the eagle that soared above Vedihitikanda’s rocky hill, instead of the traveller with a heavy camera, strutting up the stone steps, secretly hoping to be airlifted by the bird that was nowhere in sight. “High, stone steps don’t go well with short people,” my son mumbles as he follows. Kataragama, the holy sanctuary nestles on the banks of the Menik Ganga, close to the Yala Wildlife Reserve, in the deep southeast. Although Skanda, the God of Kataragama is a Hindu God, he is worshipped not only by Hindus but also by Buddhists, Muslims, and even a few Christians. To the Hindus, the sanctuary might be their most sacred shrine. 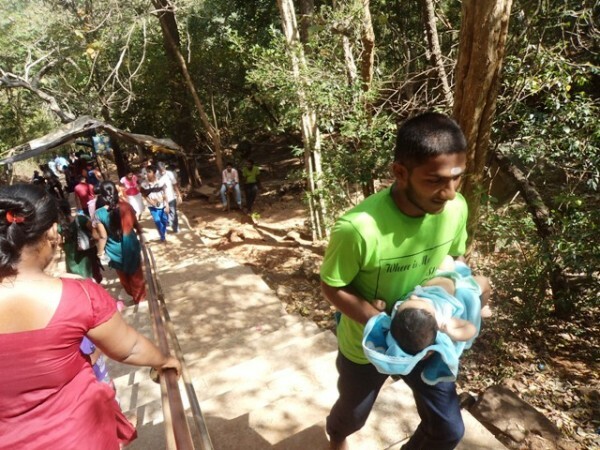 Our interest in Vedihitikanda is kindled by our spiritual journey to the sacred site of Kataragama once a year and trekking Vedihitikanda is one of the detours in our agenda. 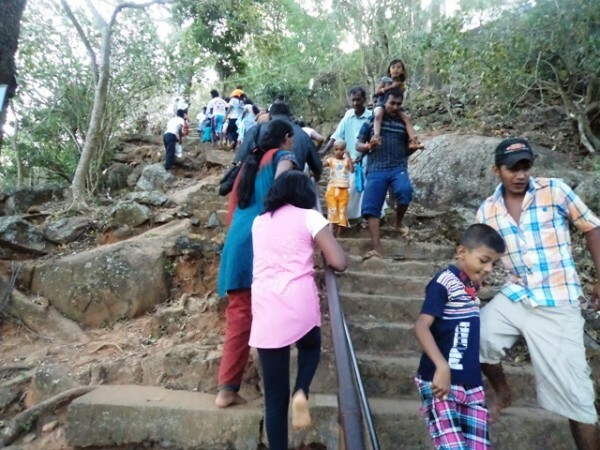 Situated about four kilometres away from the sacred city of Kataragama, the Kataragama peak or Vedihitikanda, which is its historical name known by local pilgrims, is one of the seven jagged cliffs of the Kataragama mountain range. 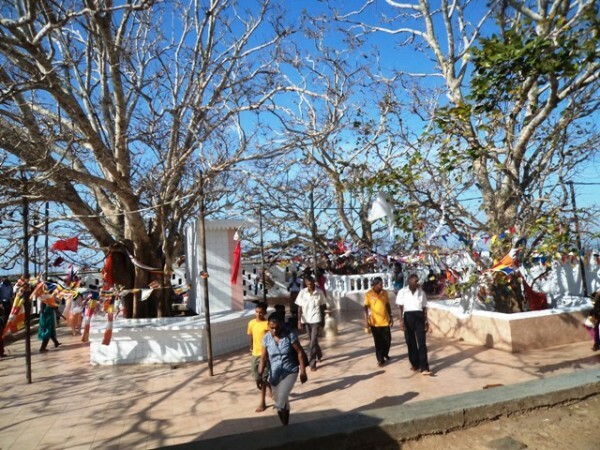 Except for the Kataragama Devalaya and Sella Kataragama, Vedihitikanda is one of the most popular destinations among pilgrims to Kataragama, which is missed by many due to difficulties of terrain. Although not much of its history is known, this mountain is buried deep in folklore and legends associated with God Skanda. 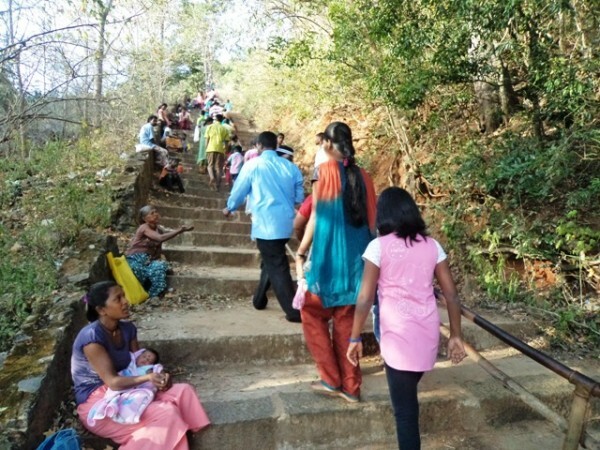 We start our climb at the foothill of Vedihitikanda where vendors sell Puja vatti and other devotional items to the pilgrim-trekkers, on both sides of the car park. Although easy transport service is available to reach the summit in a short space of time, we preferred to ascend the summit by foot as we did in our past trips, drinking in the beauty of the surrounding lush green forest and getting blessings from temple priests (kapuralas) of various devalas dedicated to various deities, dotting either side of the trek, right up to the top. However, at present, 4x4 transport facilities are available to ascend the summit on a payment and request from the office at the entrance.This service is of great value for the disabled or the elderly. The climb is steep, and alive with monkeys fighting ferociously in the area for food. A few ice cream vendors are based in the middle of the climb, knowing that trekkers would feel thirsty, and everybody wants to enjoy the ice cream. Though dust bins have been placed to collect the wrappers, nobody seems to respect the rules. Used polythene wrappers were thrown everywhere making the forest area a polythene polluted environ. We glimpsed large amounts of polythene garbage dumps destroyed here. The climb of thousands of steps is difficult but the view is most picturesque, and the greenery breathtaking. More monkeys greet us at the entrance to the shrine as we entered the main shrine room of Vedihitikanda. The stone-steps swirl around the rocks and end at a concrete pandal which indicates the entrance of the gate to the shrine. Looking below, the cliffs of the lower mountains and a panoramic view of the Kataragama sacred city with the Kirivehera lie in the northern side and to the east, the endless lush greenery of the Yala Wildlife Sanctuary paint a vivid landscape. 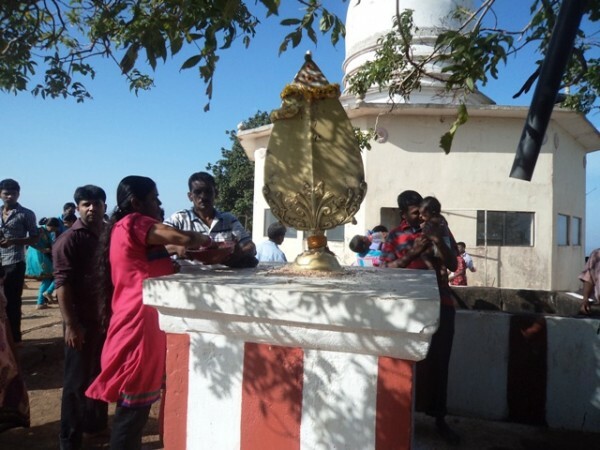 Passing the entrance, we reached the summit of Vedihitikanda where we glimpsed the main shrine dedicated to God Skanda or Kataragama Deviyo. Within this devalaya are shrines for God Ganesh, God Shiva, and God Suniyam. Bells are rung to appease the gods. 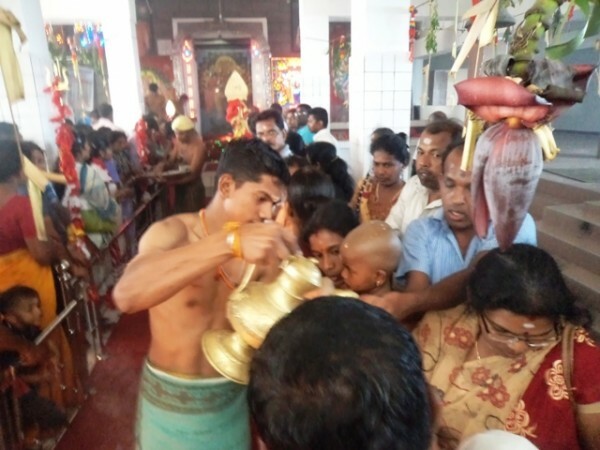 A group of Hindu devotees who come with puja watti laden with fruits to bequeath God Skanda with their requests and woes, were offering Pujas to the shrine with a chief priest, when we visited. Further away from the main shrine on the highest point of the surrounding areas of the summit there is a Buddhist temple with a shrine room, Dagoba and Bo-tree enclosure. Coins tied in red, yellow, white, and blue cloth are seen inside and outside the Devalaya where devotees have made baara (vows) to the God. To the north is a massive Shiva temple which ends in the northern side of the hill. 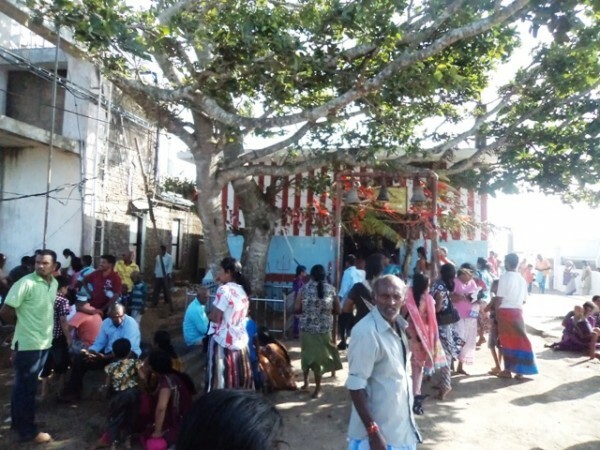 There is a rectangular shrine with brass trident built on it in an open space on the summit where mostly Hindu devotees perform Pujas with great veneration. 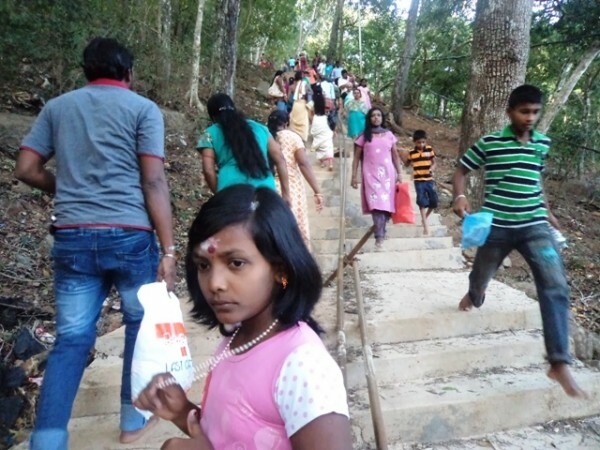 The hill shrine is the only reason that brings pilgrims here because most devotees, especially, Hindus believe this is the best place to get true blessings and the help of God Skanda who is believed to live in this celestial abode on the summit, during daytime. 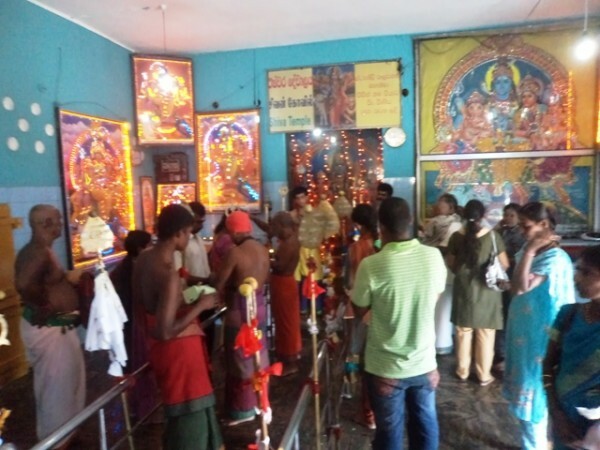 To prove this belief, the famous legend of Kataragama is in the epic Sanskrit poem ‘Skanda Purana,’ which dates back to 5th Century BC, although a Tamil version of the poem is said to have been available in the 8th Century BC. The legend has it that Skanda- also known as Kanda Kumara and the second son of Lord Siva, who was the highest God among Hindu deities- came from India to Kataragama when he heard of Valli Amma, an exceedingly beautiful girl who lived in the jungles of Kataragama. Valli was the daughter of a doe mother and hermit father, and had been adopted by a Veddha chieftain. Skanda came in search of Valli in the guise of an old beggar and asked her for food, drink and her hand in marriage. The first two she gave him but turned down his offer of marriage. Just then an elephant came crashing out of the jungle and frightened her. It was Skanda’s elephant-headed brother, Ganesh. The two had planned the escapade to persuade her to marry him. This incident is said to have happened in what is today known as Sella Kataragama, and a temple dedicated to Ganesh is situated here. Skanda soon transformed into a young man and the couple were married and lived on the Kataragama peak, or Vedihitikanda (the mountain where they stayed), one of the seven hills of Kataragama. However, there was a hitch, Skanda already had a wife, Deva Sena, or Theyvanai Amma. When she heard of his second marriage, she was jealous. She came with a retinue to Kataragama and persuaded the couple to come down from their hill and live with her. They complied and the three lived happily ever after. However, legend has it that there are remains of an ancient shrine on the top of the summit, newer structures have come up and the antiquity of this hallowed mountain has totally disappeared. Still the climb to the top of this mountain is a unique spiritual experience and the panoramic view from the summit is breathtaking. We sit for a while and enjoy the gentle evening breeze on the summit. We look down and realize it is a long journey back. Arriving back at the entrance, we were deep in thought, the Vedihitikanda has remained in the beliefs of the genuine devotees over thousands of years as the great power of the God Skanda continues to provide protection to those who seek his blessing.